Beetle Jewels is the latest slot title to be released by iSoftBet. The game has gone live at many online casinos that are powered by iSoftBet games, and it is proving to be quite a success and it became quite popular among players. The game is a pretty rewarding slot that has a lot to offer to its players, whether through the 10 lines, or with the help of the very special icon that the game has. The new slot has a wonderful fairy tale theme that it presents in great visuals and symbols, paired with great music to create an immersive and a highly engaging gaming experience that players will never get enough of. iSoftBet’s newest title, Beetle Jewel has a great and a unique theme. This is because the game invites players to enjoy their slot experience in an enchanted forest from the fairy tale world. Players will join a new fairy tale species, the Beetle Jewels. They are beetles that have bodies made out of different precious gems and jewels. The most rewarding and special beetle jewel of them all is the Diamond Beetle Jewel. Players will embark in this fairy tale adventure as they get to claim their own share of the prizes and the fortunes of the mystical forest. The game play is quite easy, as players will choose how much they want to place in bets underneath the reels. It is where the control panel is. They will place their bets, spin the reels and watch the game as they claim plenty of rewards. iSoftBet is well known for its visually satisfying video slot machines. Everything that is visual about the game is designed with attention to details. Players will see that the 5 reels of the game are located in the enchanted forest with beautiful trees and exotic plants in the background. As for the symbols that the players will see appearing across the reels and the lines of the game, they include the diamond beetle and other beetle jewels in addition to the card symbols. The game has a very special icon which is the diamond beetle. 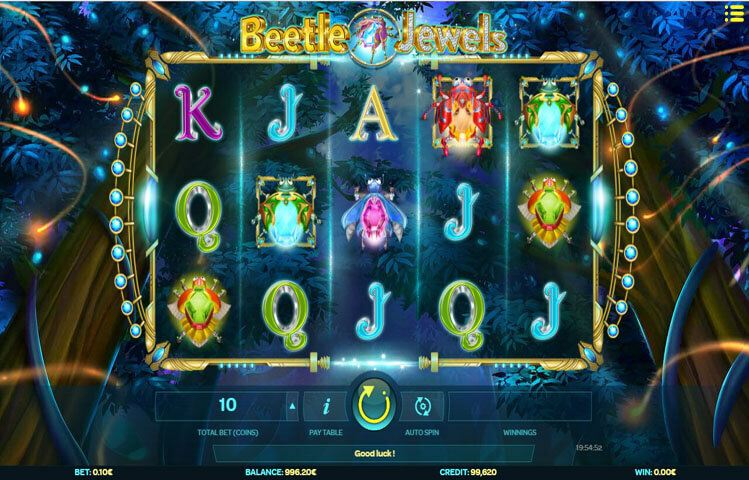 This diamond beetle acts as the wild as it can replace all other symbols appearing anywhere on the reels of the game and its lines to help players in creating the best payout possible. It can also give great line prizes when it is matched on the reels. Other than being wild, it can also activate the free spins round when 3 to 5 of these diamond beetles land on the reels. This will give players a total of 10 free spins on the video slot machine.